These personalized desk signs come in many sizes and finishes. The piano finish rosewood desk signs have a beautiful glossy finish that will add a wonderful shine to your desk. We also carry a marble desk sign made that has more weight to it than the rosewood desk signs. 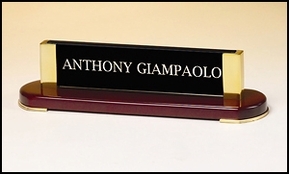 Also available is the personalized desk sign with a business card holder. Our engraved desk signs are wonderful pieces of office decor that make the perfect personalized gift for any teacher, boss or co-worker. With a variety of sizes, styles and finishes you can be sure to find an engraved desk sign that will be a perfect match for any desk. There are many font styles & logos to personalize your engraved gift with.